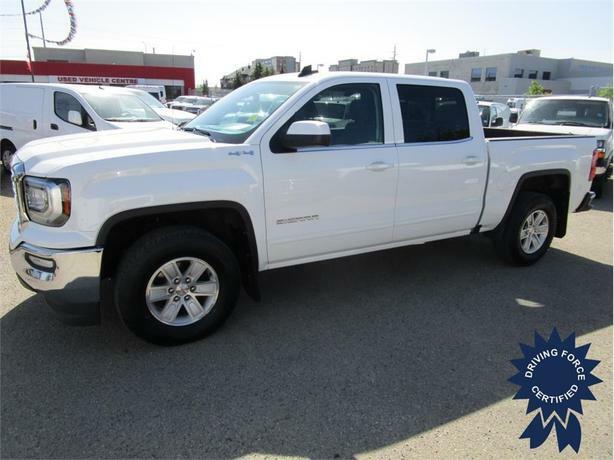 This 2017 GMC Sierra 1500 SLE Crew Cab 6 Passenger 4X4 Truck has a 5.5-foot short box, 143.5-inch wheelbase, factory remote start, fog lights, chrome bumpers, chrome grille, easy clean vinyl floor, 6-speed automatic electronically controlled transmission, 3.42 rear axle ratio, Bluetooth for phone, cloth seat trim, 8-inch Diagonal Color Touch Screen with IntelliLink, integrated trailer brake controller, 10-way power adjustable driver seat, power-adjustable pedals, trailering equipment, engine block heater, backup camera, WiFi hotspot, tire pressure monitoring system, dual-zone climate control, 17-inch alloy wheels, AppleCar Play/Android Auto, balance of factory warranty, clean CarProof vehicle history report, 120 point certification, and balance of factory warranty. The GVWR rating is 7,200 lbs (3,266 kgs). Call or email one of our knowledgeable fleet sales consultants to experience the DRIVING FORCE difference today.